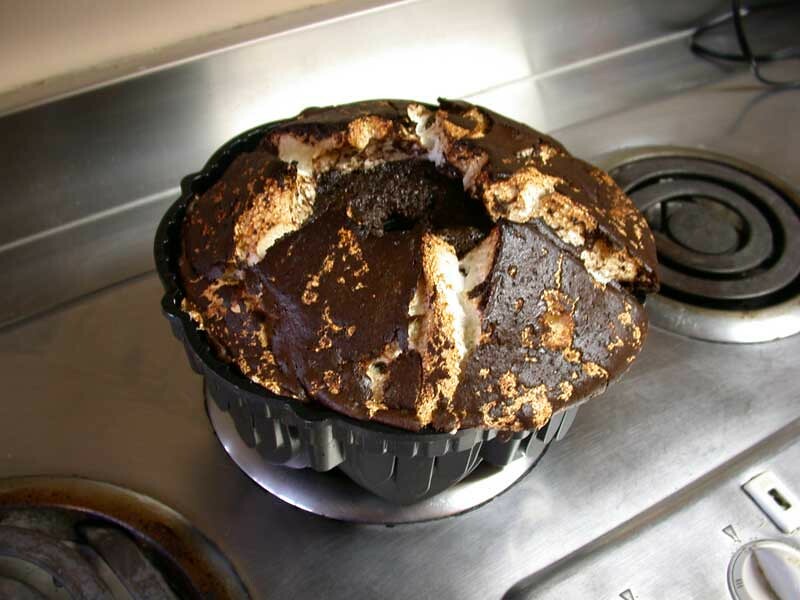 The other day I was wanting to make a marshmallow filled chocolate bundt cake-- kind of like a Suzy Q snack cake. So I figured I'd make the cake batter, fill half the pan with it. Layer marshmallow Fluff and cover with remaining cake batter. Well, the above is how it turned out. It's a matter of physics. The marshmallow had more air in it than the cake batter so it rose to the top of the pan (inverted, this meant the marshmallow was on the bottom) It got brown and crusty and wasn't really creamy marshmallow anymore. So long shot-- it didn't work. But the cake was good. Combine flour, sugar, cocoa, baking soda and salt in large mixing bowl. Add butter, sour cream, milk, eggs and vanilla; blend on low speed, then beat for 3 minutes on medium speed. Pour batter into a well-greased and floured Bundt pan. Bake at 350 degrees for 60-65 minutes or until toothpick comes out clean. Cool 10 minutes. Remove from pan. Cool on wire rack. Glaze with Sprinkle with powdered sugar. Yield: 12 servings. hee hee.. uh.. no. But I sure wish ya could come over for a slice.